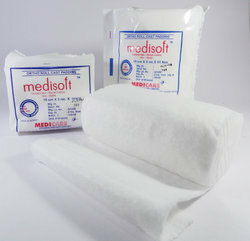 Pioneers in the industry, we offer ortho roll cast pad from India. With our expertise in this domain, we are engaged in manufacturing, supplying and exporting Ortho Roll Cast Pad. Manufactured under the supervision of experienced professionals, these roll cast pads comply with the established norms and standards of the industry. In addition to this, our experts keep vigil on the entire production process, so as to maintain higher quality standards and remove defects, if any. Extensively used for for protection of bones from elevation or projection, these pads reduces the chances of skin maceration and acts as a cushion between cast and skin. Acts as cushion between the skin and cast. 10.0 cm X 3 mtr. 15.0 cm X 3 mtr. 7.5 cm X 3 mtr. 05 cm X 3 mtr. Port of Dispatch: Mundra Port, Gujarat, India.